Sri Lanka has informed the UNHRC today the anti-Muslim violence that erupted in Southern Sri Lanka was instigated by several Muslims while conveniently ignoring the role played the Buddhist group Bodu Bala Sena (BBS) in the deadly attacks. 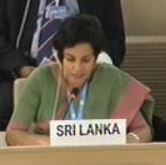 Deputy Permanent Representative to the United Nations in Geneva, Manisha Gunasekera who placed on record the sequence of events that led to the incidents of communal violence in Aluthgama and Beruwala noted an incident that occurred on June 12 involving a Buddhist monk and some Muslim youth as the starting point of the chain of events that led to violence on June 15 and 16 in the areas. “On 12th June, a Buddhist monk was assaulted by three Muslim youth, following a dispute. The three suspects were produced before the Magistrate and remanded, while the monk who made a statement to the Police, was admitted to hospital. On 15th June, the Buddhist monk was proceeding to the temple accompanied by some other monks and lay persons, when stones were thrown at the group as they were passing the Mosque in Dharga Town. This incident led to the violence, which spread to Beruwala by 16th June. Police was compelled to use tear gas and impose curfew to bring the situation under control,” she informed the Council. Nowhere in the sequence of events has the rally that was held by the BBS or the racist comments made by its General Secretary Galagoda Aththe Gnanasara been mentioned. Gunasekera addressing the Council furthermore has added the Government of Sri Lanka does not condone any acts of violence against any religious or ethnic community while adding the government remains deeply committed to protecting the lives of all its citizens, places of worship and property. These statements were made exercising a Right of Reply in response to references made by Germany, Norway and Canada during the General Debate at the 26th UNHRC sessions today. In response to references made by Germany, Norway and Canada, Sri Lanka wishes to place on record the sequence of events that led to the incidents of communal violence in Aluthgama and Beruwala in southern Sri Lanka on 15th and 16th June, and the action taken by the Government. On 12th June, a Buddhist monk was assaulted by three Muslim youth, following a dispute. The three suspects were produced before the Magistrate and remanded, while the monk who made a statement to the Police, was admitted to hospital. On 15th June, the Buddhist monk was proceeding to the temple accompanied by some other monks and lay persons, when stones were thrown at the group as they were passing the Mosque in Dharga Town. This incident led to the violence, which spread to Beruwala by 16th June. Police was compelled to use tear gas and impose curfew to bring the situation under control. Three people (two Muslim and one Tamil) lost their lives due to the violence. Twenty six people belonging to both communities were hospitalized, 13 Sinhalese (including 6 Police Constables), and 13 Muslim. Altogether, 69 houses, 83 shops and 11 vehicles were damaged, belonging to people of both communities. The persons who have been displaced are being accommodated in temples, mosques and schools. The Inspector General of Police has ordered parallel investigations by the Criminal Investigations Department and the Colombo Crimes Division. By 16th June, the situation in both areas was brought under control by the law enforcement authorities. Forty three people have been arrested, comprising 28 Sinhalese, of which 17 (12 Sinhalese and 5 Muslim) are in protective custody. Twenty three persons have been released on bail. On 16th June, the Hon. Prime Minister, who is also the Minister of Buddha Sasana and Religious Affairs, chaired a meeting at the Kalutara District Secretariat, consisting of the clergy, local politicians of all communities, Provincial Councillors and Ministry officials, and discussed ways and means of bringing the affected areas back to normalcy, and helping the people to be resettled. President Mahinda Rajapaksa, immediately on return from Bolivia on 18th June, travelled to the affected areas. In Beruwala, the President chaired a meeting of around 50 religious leaders of Buddhist and Muslim faiths. Buddhist monks as well as the Board of Trustees and leaders of Mosques participated in the meeting and condemned the violence which was trigged by the assault of a Buddhist monk. Muslim and Buddhist leaders agreed to undertake and support programmes to promote inter-religious harmony. Extreme elements on both sides are being addressed by the Government. President Rajapaksa has assured all communities that an impartial inquiry will be held to bring to justice those responsible for the violence, irrespective of race, religion or ethnicity. The President has also assured that all damaged properties will be repaired, and has also directed the launch of a special programme supported by the District Secretary and all Government, Semi-Government and Local Authorities to bring the area to normalcy. The Sri Lanka Army is currently in the process of estimating damages to property. The Ministry of Rehabilitation is conducting its own estimates in a parallel process with the District Secretary. Funds for repairs will be channelled through the Ministry of Rehabilitation. The Ministries of Social Welfare and Disaster Management are in the process of providing food and resettling the displaced persons. All those indulging in hate speech will be taken in for questioning. All Sri Lankan people enjoy freedom of religion, which is a constitutionally guaranteed right. The four major religions have harmoniously co-existed in the Island for centuries. The Government does not condone any acts of violence against any religious or ethnic community. In all instances where credible information relating to incidents has been available, the Government has taken appropriate action. Sri Lanka therefore wishes to assure this Council that the Government remains deeply committed to protecting the lives of all its citizens, places of worship and property. In response to Norway urging Sri Lanka to cooperate with the OHCHR investigation mechanism, we reiterate that Sri Lanka has already placed on record its position with regard to this investigation in its Item 2 statement. Sri Lanka remains firm in its conviction that the Council’s efforts should be constructive and not coercive, and truly contribute to a State’s own efforts in promoting and protecting human rights in accordance with the method of work of the Council. It is because of people in power giving stupid statements such as this, full of blatant lies that SL has lost credibility internationally. Speeches by BBS prior to the incident is freely available..speeches inciting racial hatred. Even if a few Muslim youth were responsible, it does not justify what is happening at all. The three Muslim Youth have already been remanded but the person responsible for the murders and destruction of livelihood roams freely. Justice is not blind anymore. GoSL spokespersons have developed prevarication into a fine art. In this official statement, the spokesperson has totally omitted to mention the name of the chief instigator, Galagoda Aththe Gnanasara Thero, who played an instrumental role in triggering all the carnage that took place. By the way, is Manisha Gunasekera related to Keheliya Rambukwella? If not, to Nimal Siripala de Silva? Shame on you madam! you know you are lying, you know the violence was instigated by a BBS speech, how can you live with yourself? Manisha!!! You are no better than Ariya Singer.